Finding ‘wild’ comb in my hive and extracting honey from it. It’s been a very busy couple of weeks for me with filling orders over at Lovely Greens Handmade, taking guests on a quirky weekend tour of the Isle of Man, and working in the garden. Something had to give and this time it was my bees. 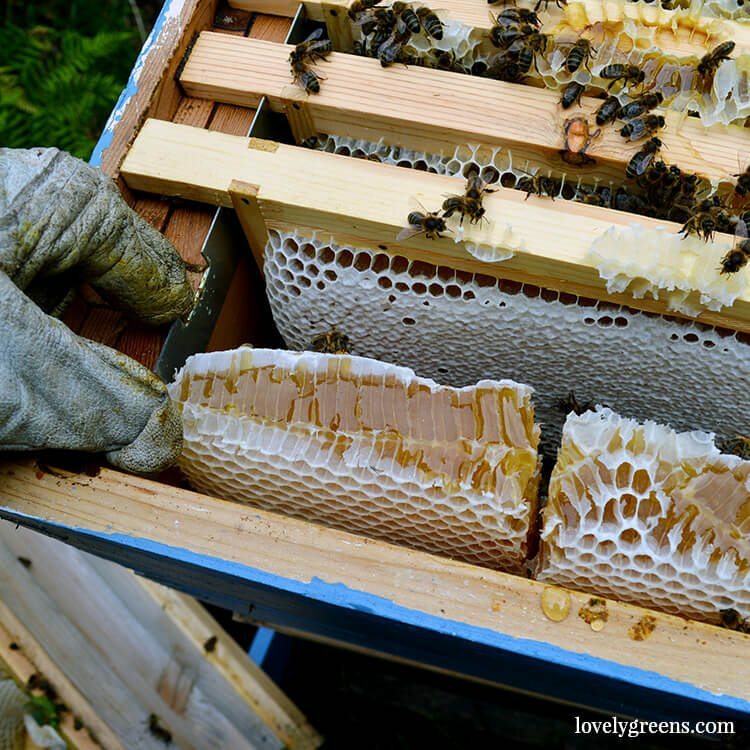 A couple of days ago I visited them for the first time in a couple of weeks and found that one of my colonies had been very busy indeed – not only filling the empty super I’d not taken off the hive with fresh honeycomb, but also building comb into a space that I’d forgotten to leave a frame. Doh! Regrettably I had to cut the comb out but fortunately I could use both the beeswax and the honey. Getting it out was easier than I thought it would be at first glance – the comb that they’d built in the top super box was easily sliced from the roof. Afterwards I bundled it into plastic bags to keep the bees out. Fortunately the colony that I was working with was the calmer of the two and easier to manage. The rectangular comb they built inside the box of frames was also easy to take out and it’s actually given me some ideas. I forgot to fill the last space in the back with a frame and the bees created a perfect replica of frame-style comb in the space. I sliced it into three with my hive tool and then pulled it out. The video shows just how easy it was. Cut comb is a special treat so I’m planning on ‘forgetting’ to put that extra frame in again. The first step was draining as much of the uncapped honey off of the comb. Uncapped honey has a higher water content, a runnier consistency, and might not last as long as capped honey. I’m planning on using this uncapped honey to make mead. Crushing the honeycomb with a spoon or potato masher. 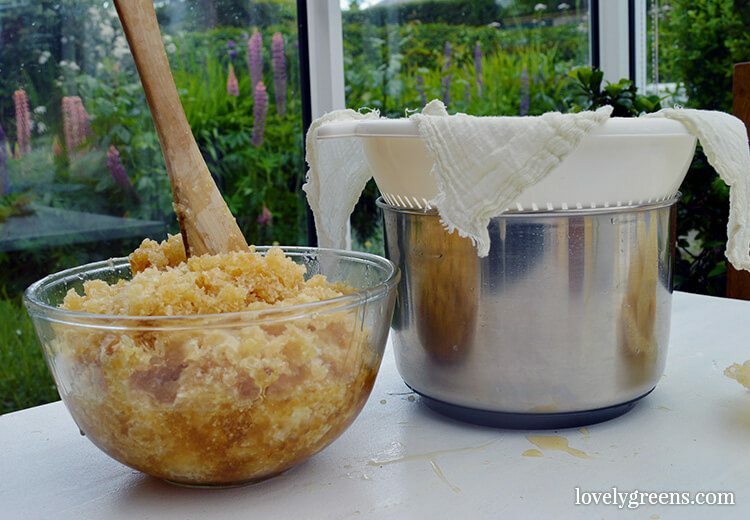 Straining the honey from the mess using a kitchen strainer and cheese cloth. Catching the honey in a bowl underneath the strainer. It can take a day+ to fully filter. Pouring the raw honey into jars for storage. 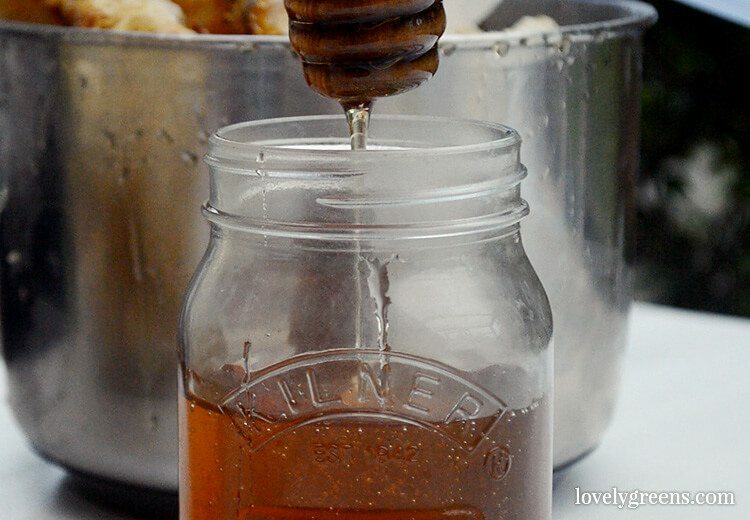 Sometimes silly mistakes can lead to new ideas and a fresh batch of honey! In the meantime, I’m back up visiting my hives today with some brand new frames for them to build on. Hi, I had bought to bee boxes from a gentleman on the weekend. When my husband brought them home low and behold they are full of honey still, left over from the winter. Is that honey still good. We tasted abit of it and it tasted amazing. Honey has one of the longest shelf-lives of any food stuff! So to answer your question, yes it’s still edible. Why bother-‘forgetting’ to put a frame in again? It would be much easier to just put an unwired frame in the spot with a comb guide or foundation strip along the top, get them building comb in the frame. 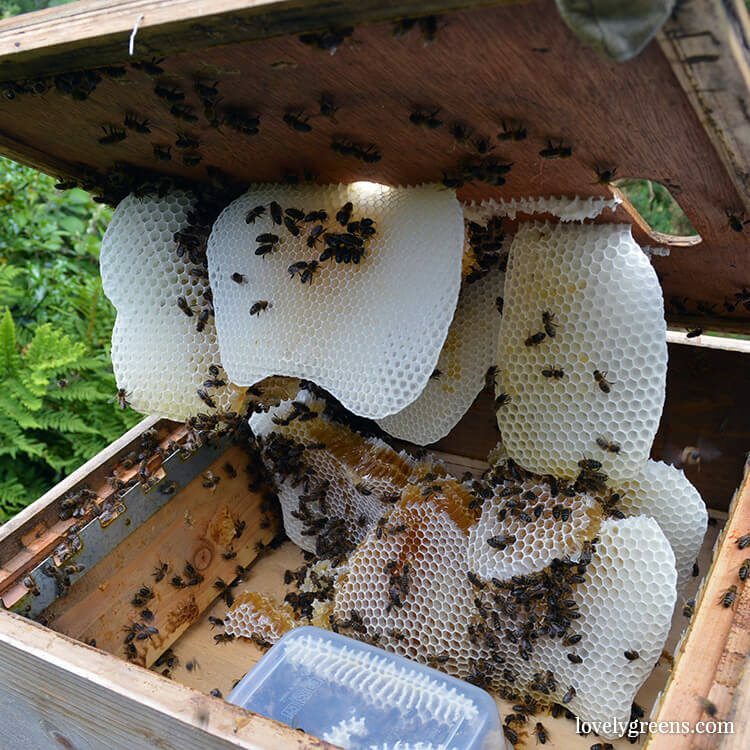 This would be much easier to lift put of the hive box, it wouldn’t get attached to the sides of the box and would be much easier to inspect to see if the cells have been capped (I.e. : it’s ready to harvest). Then just simply cut it out of the frame for cut comb. 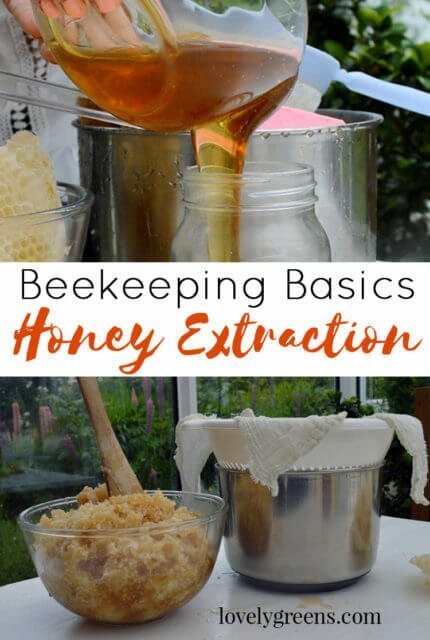 Really enjoyed watching your beekeeping video. Planning to start my own very very, soon. I would like to have about the same as what you have. Not so many hive boxes that I can’t take care of. Maybe two to three would be plenty. I would like to thank you for sharing. Good luck with your adventures in beekeeping Zane — 2-3 are definitely plenty! Its amazing what the bees will do if you leave them space. 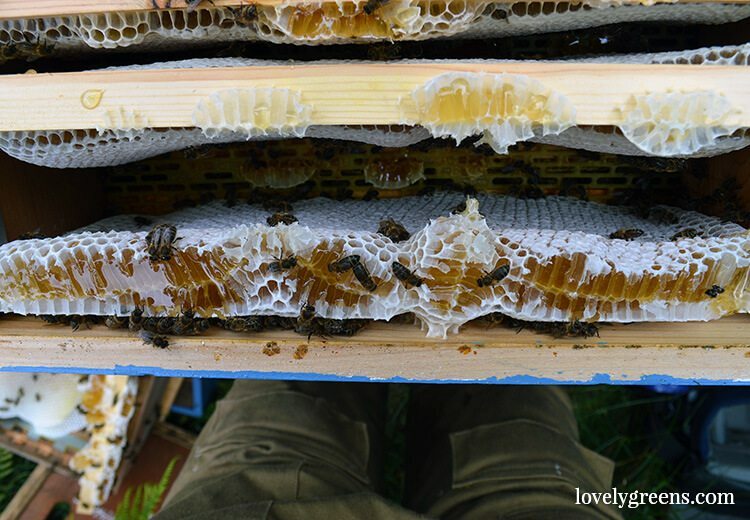 We have a layer of lino on top of the frames to discourage them from building in the lid as it can be difficult to get the hive open! Now there’s a clever tip!